We begin our season each April with honey made from the nectar of big-leaf maples, followed quickly by raspberry, a light-bodied honey perfect for tea. Midsummer brings long, sunny days, and with them, blooming flowers of all kinds: blackberry, thistle, wild rose, sweet pea and numerous herbs. Our wildflower honey is perfect for both sweet and savory food pairings. We also offer an alpine flower honey from high-elevation mountain flower meadows. Fireweed, the champagne of honeys, ends our harvest season in August. This light, bright honey comes from nectar gathered by bees above 3,500 ft in the Mt Baker National Forest. Beginning with high quality, un-aged balsamic vinegar of Modena, we reduce and concentrate until a highly flavorful syrup is all that remains. To this, we add a touch of our wildflower honey and finish it with sea salt. The result is a thick, richly flavored condiment that maintains a perfect balance of sweetness and acidity. Enjoy BeeWorks Nectar with creamy cheeses or fresh fruit; as a salad dressing with olive or nut oil; drizzled over roasted vegetables; or even spooned onto vanilla ice cream or a dark chocolate cake. 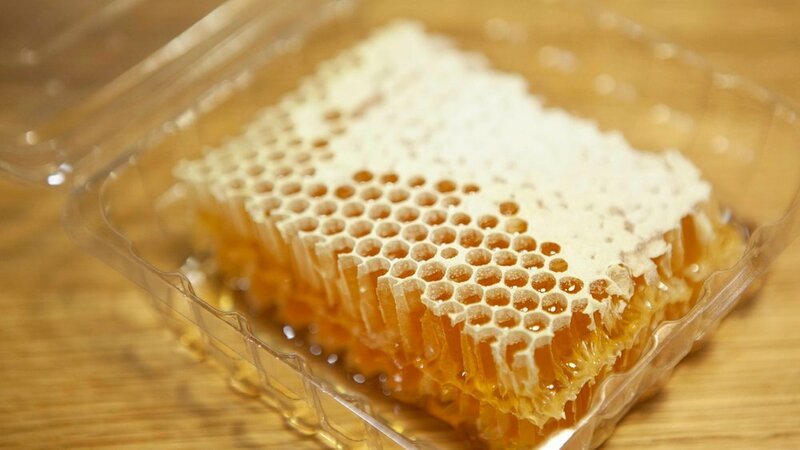 Comb honey is a truly artisan product. Only our strongest and healthiest hives can produce comb honey. It is harvested during a brief six-week period at the peak of midsummer and is made from the nectar of raspberry, blackberry and fireweed flowers. Each bite yields sweet honey and beeswax, which naturally sticks together and may be discarded like a fruit pit or harmlessly ingested. Comb honey can be served as a sweet treat in its own right or as a stunning counterpoint to a cheese or charcuterie plate. It can also be spread directly onto warm bread or toast.